From: The Enid SPCA, Enid, Okla. It can be difficult sometimes to realize life’s blessings when dealing with a loss. 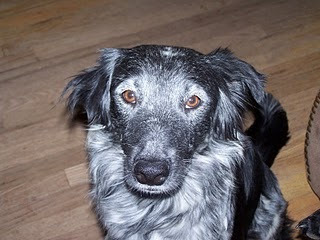 Our border collie Sheba had passed away suddenly, and it felt like our hearts would never stop aching. My husband and I would make a “date” a couple Saturdays a month and spend it together volunteering at our local SPCA here in Enid, Okla. So one Saturday my husband went solo while I stayed home with a sick child. 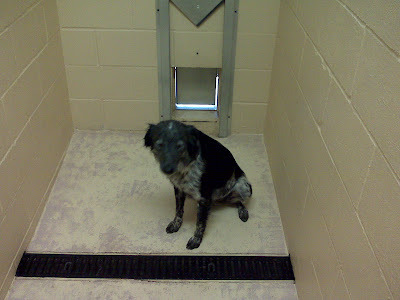 About an hour after he had been gone, he sent me a picture of a timid, four-legged beauty that had just arrived at the SPCA a few days before. She had been found wandering in the country with her pups and had been fostered until she was the only one left for adoption. I didn’t know if I was ready to “replace” my Sheba, but each time I glanced at the photo on my phone, my heart would melt a little more. Then my husband told me she was a border collie/Aussie shepherd named Cheyenne, and I knew then it was fate. Why? Because I am originally from Cheyenne, Wyo., and the coincidence was too much to ignore. Our family waited until the next day to go visit her, and while she was shy at first, once we put a leash on and led her to the play area she immediately warmed up to us. We knew then that we had a keeper. Being a military family, we decided Americah would be a great name for our newest family member. It has been a little over a year since Americah joined our family, and while some may think that she was blessed because she has found her forever home, it is our family that is truly blessed. My husband and I believe that by doing our part to assist animals in need, we teach our children compassion for animals and respect of life. Thanks so much for sharing Americah's story, we are proud to have been featured on your blog. Keep up the good work, you are an star! You're welcome -- and thank you! And "woof" to Americah!